Always Greener is an installation of over 100 different samples of artificial grass laid out on the ground in the form of a partitioned landscape. 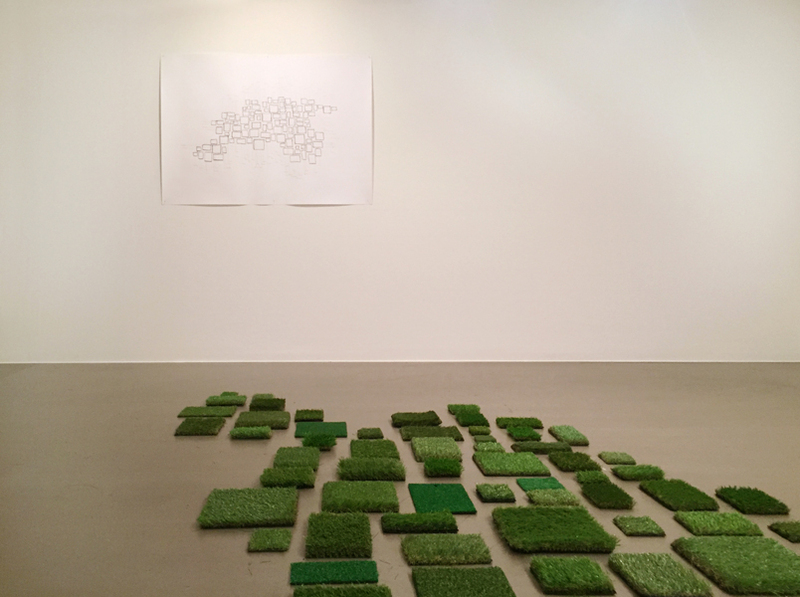 The floor piece is accompanied by a map drawing on the wall, which provides a guide to the names of the grass patches on the ground. Marketed with aspirational names ranging from Green Bliss and Eternity, to California, Malaga, Tuscany and South of France, these artificial grass products aim to conjure particularly desirable geographical locations, or to invoke feelings or states of mind associated with pleasure and serenity. 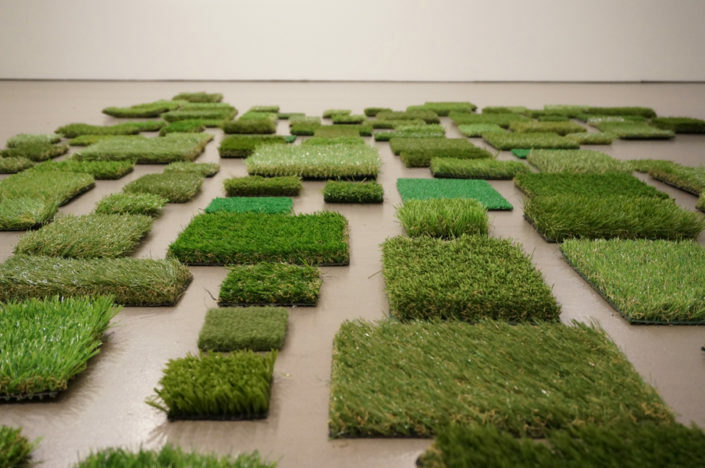 As a perfected version of the real thing (“more real-looking than real grass”), artificial grass promises permanence, unfading – and effortless – beauty, and a state of undying greenness that defies natural cycles of life and death, of withering and renewal. 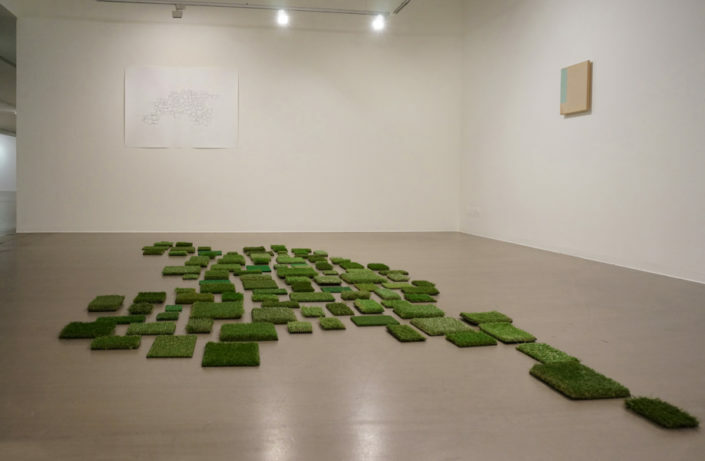 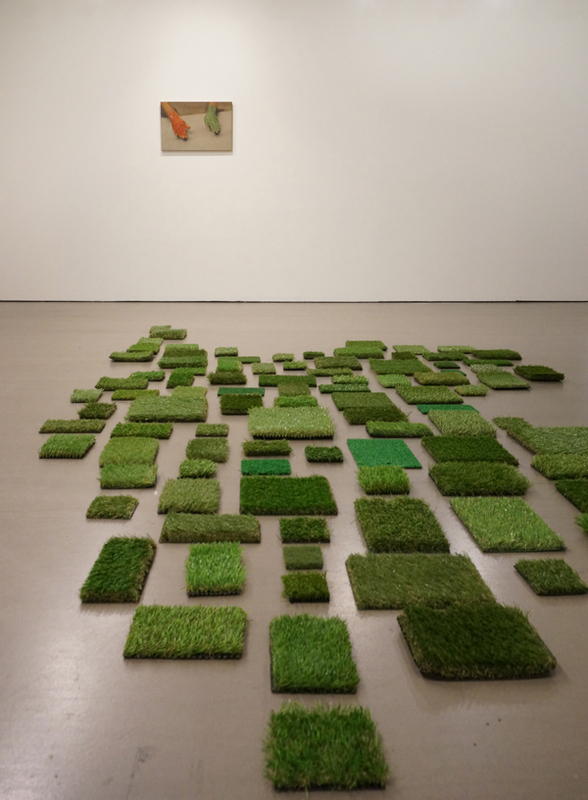 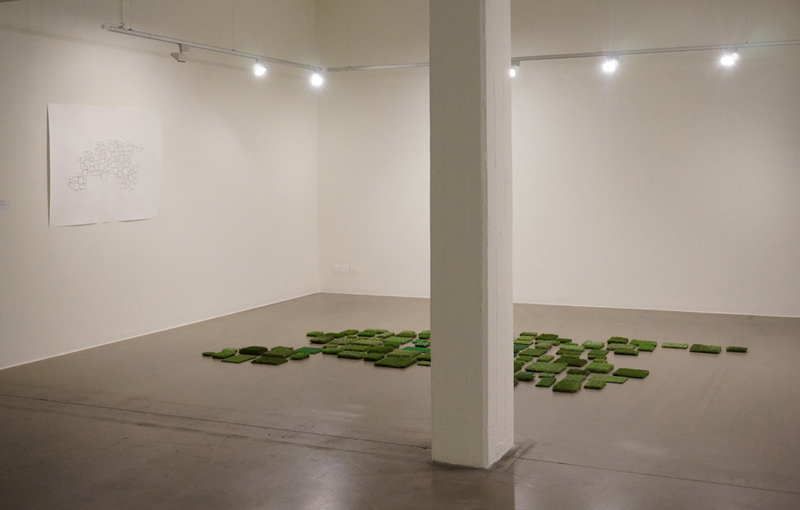 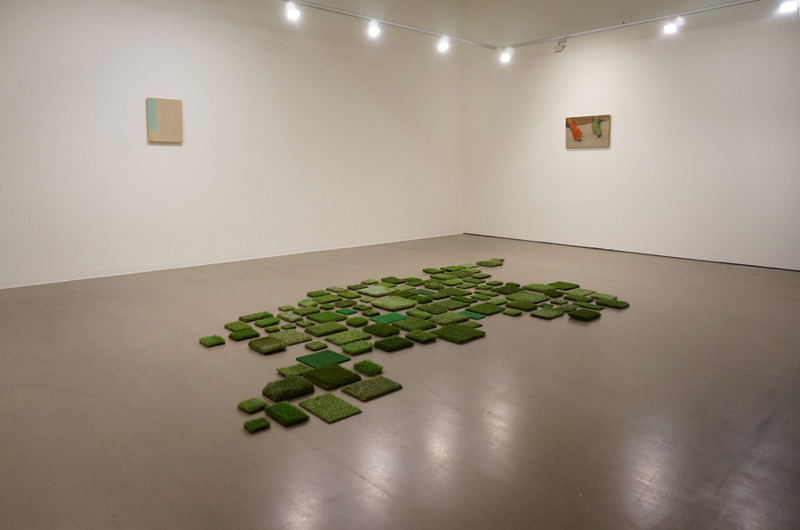 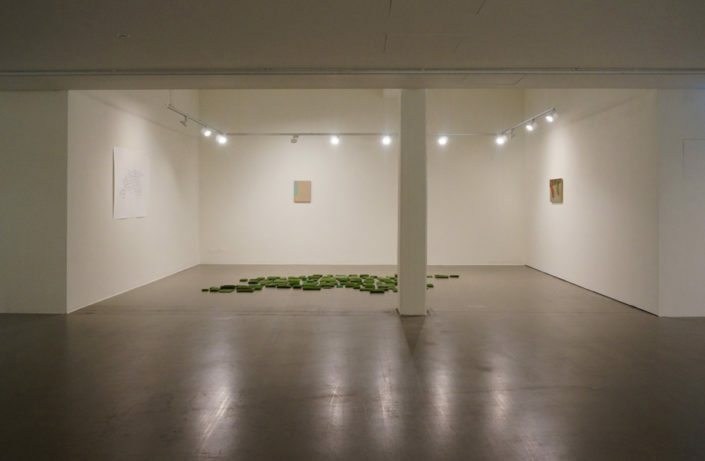 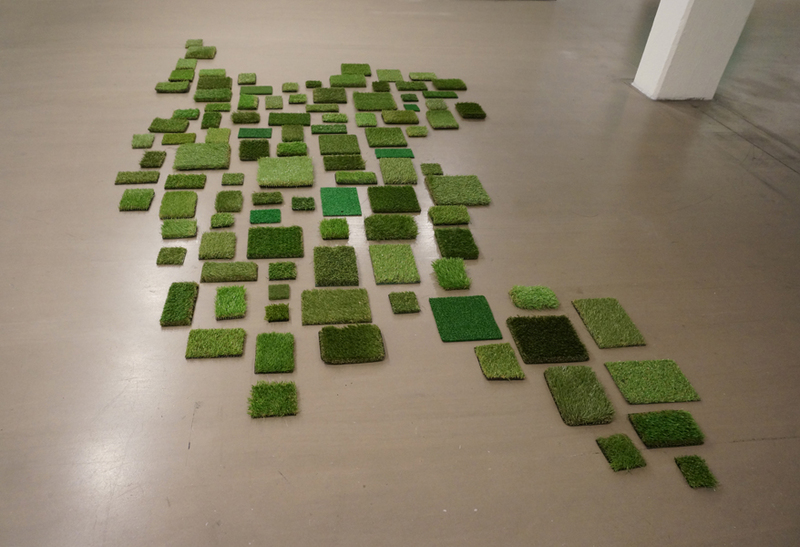 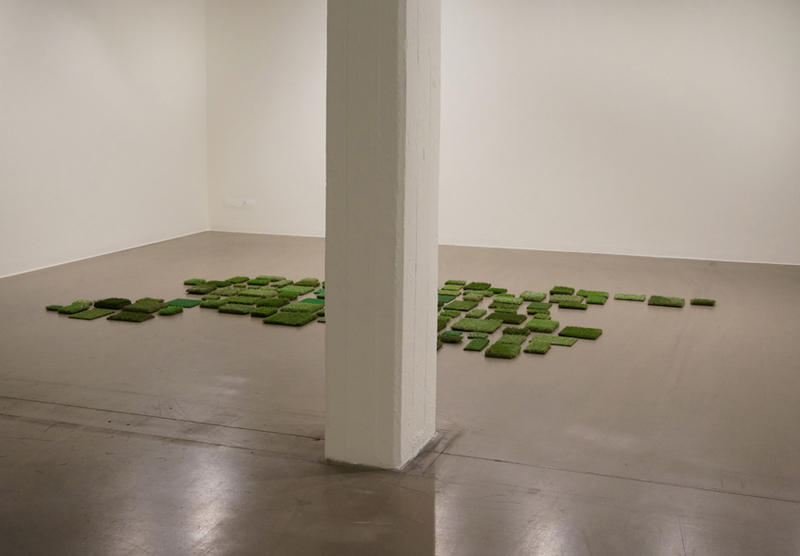 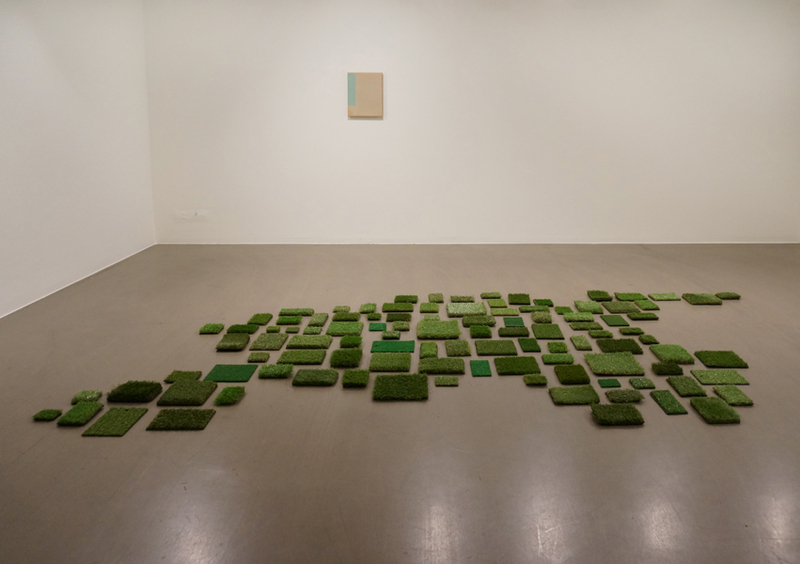 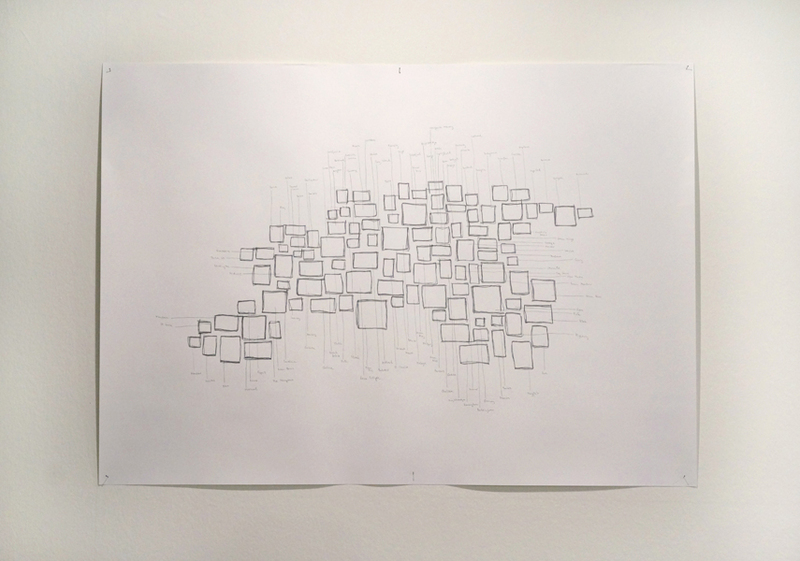 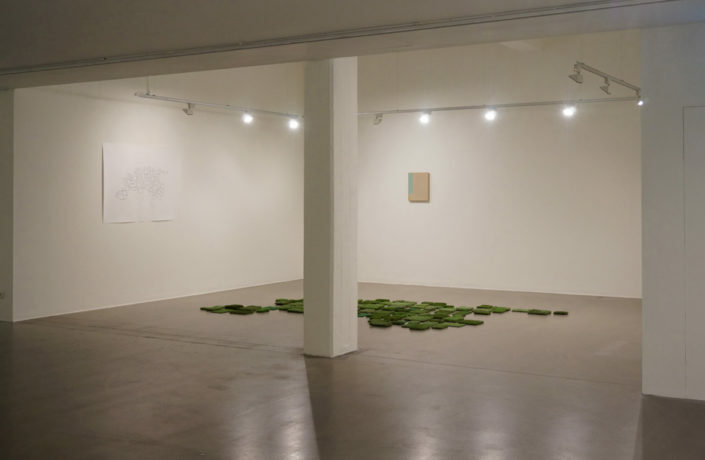 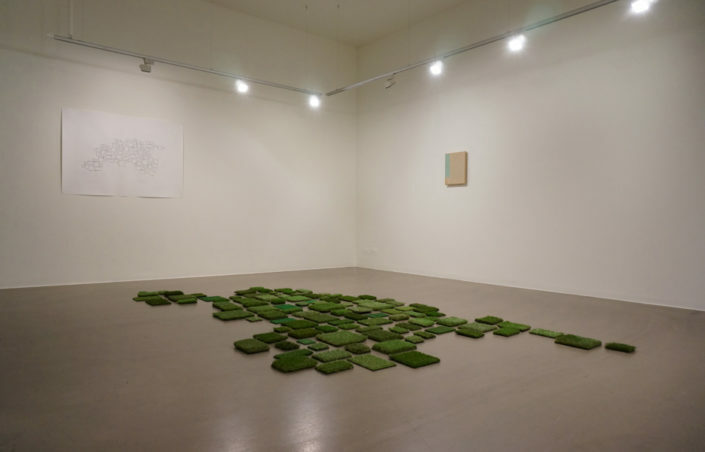 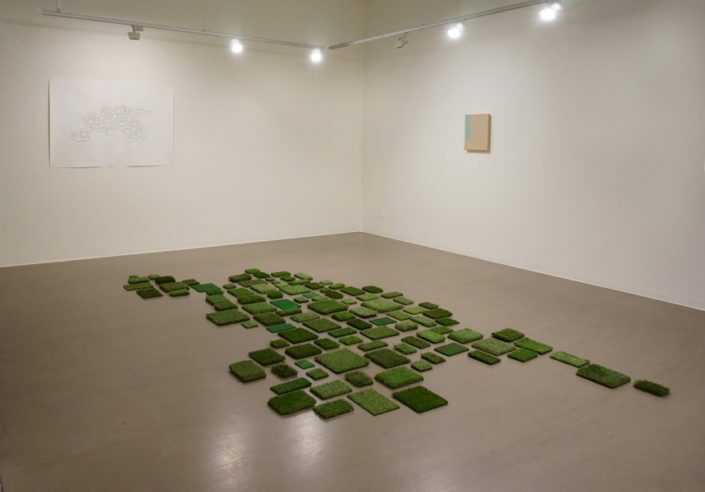 The title of the installation takes a fragment of the saying “The grass is always greener on the other side,” in order to speak of our desire for what we don’t (and cannot) have, and to point to our yearning for an imaginary ‘elsewhere’ which we perceive to be better than what we do have. In that sense, Always Greener stages a kind of an idealized territory, where everything exists in a perpetual state of plenty, beauty, calm, and leisure. However, this artificial landscape is presented as a kind of a “non-place”, an unattainable simulation of a world which is all image and appearance, and which can only ever be a fantasy. 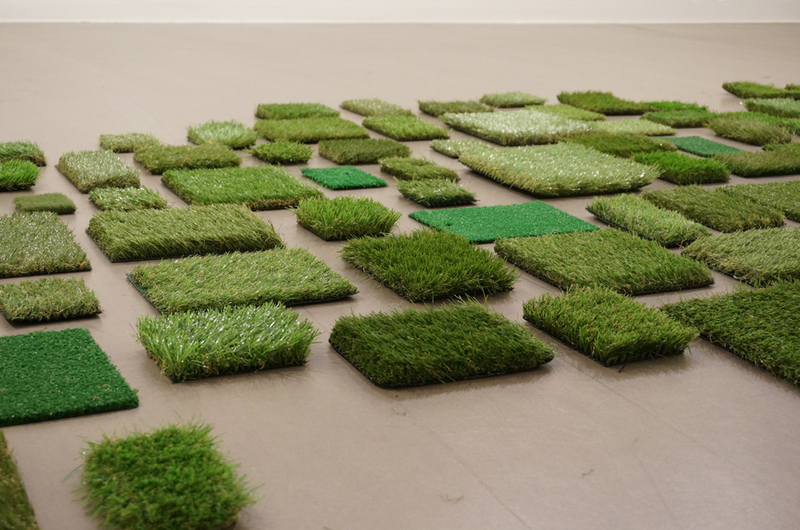 At the same time, the piece floats a rather grim possibility of a world in which plastic simulation has replaced nature, offering a frightening but rather real hint of where we seem to be heading.